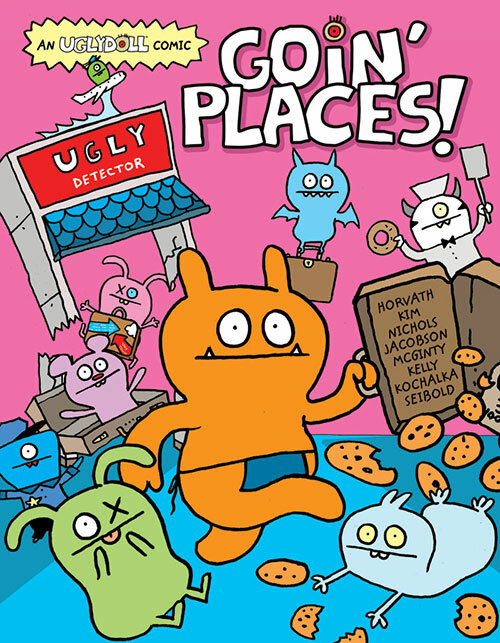 The UGLYDOLL graphic novel series features stories written by Travis Nichols, art by Uglydoll co-creators Sun-Min Kim and David Horvath, Ian McGinty and Phillip C. Jacobson. Each volume features special guest artists, including Eisner-winner James Kochalka, Eisner-nominee Jacob Chabot, Peter Fowler, Junko Mizuno, Mike L.E. Kelly and Bwana Spoons, among others. "UGLYDOLL is 'Going Places' with VIZ Media as we launch our first comic book series and blast off to the 'Blueberry Moon'!" says Alita Friedman, Chief Brand Officer of Pretty Ugly, LLC. "The great fun the UGLYDOLL team had creating this series comes through on every page," says Traci Todd, Senior Editor, Children's Publishing. "The art is beautiful and vibrant, and we tried to pay homage to Sun-Min and David's distinct sense of humor and play. We hope we've created something Uglydoll fans will love." Since David first drew Wage™ on a love letter to Sun-Min in 2001, and Sun-Min turned that drawing into a doll, UGLYDOLL has evolved into an entire universe of characters, stories, and products for all ages. Proven sales and retail are evidenced by the brand constantly winning Best Toy Awards by TIA, Learning Express, Fat Brain Toys, TD Monthly, Oppenheim, Funfare, Parent's Choice, iParenting, and Creative Child among others. UGLYDOLL has achieved status as an 'evergreen' property and is merchandised among the biggest brands in the toy market. For more information on UGLYDOLL, please visit www.uglydolls.com. For more information on VIZ Media's all-ages graphic novels and manga, please visit http://VIZKids.com. The Uglydoll brand was launched in 2002 by Pretty Ugly, LLC with offices in Los Angeles and Green Brook, NJ. The brand is distinguished by David & Sun-Min's unique aesthetic and voice defining 'ugly' as distinctive, different, and good. The award-winning Uglydoll characters appear in a variety of toys, books, apparel, and other licensed products that are available in thousands of stores, worldwide. In its first ten years, Pretty Ugly has produced and sold millions of Uglydoll items. For more information, please visit www.uglydolls.com. Headquartered in San Francisco, California, VIZ Media distributes, markets and licenses the best anime and manga titles direct from Japan. Owned by three of Japan's largest manga and animation companies, Shueisha Inc., Shogakukan Inc., and Shogakukan-Shueisha Productions, Co., Ltd., VIZ Media has the most extensive library of anime and manga for English speaking audiences in North America, the United Kingdom, Ireland and South Africa. With its popular digital anthology WEEKLY SHONEN JUMP and blockbuster properties like NARUTO, BLEACH and INUYASHA, VIZ Media offers cutting-edge action, romance and family friendly properties for anime, manga, science fiction and fantasy fans of all ages. VIZ Media properties are available as graphic novels, DVDs, animated television series, feature films, downloadable and streaming video and a variety of consumer products. Learn more about VIZ Media, anime and manga at www.VIZ.com.